I feel so honored that you decided to stop by my little blog today! 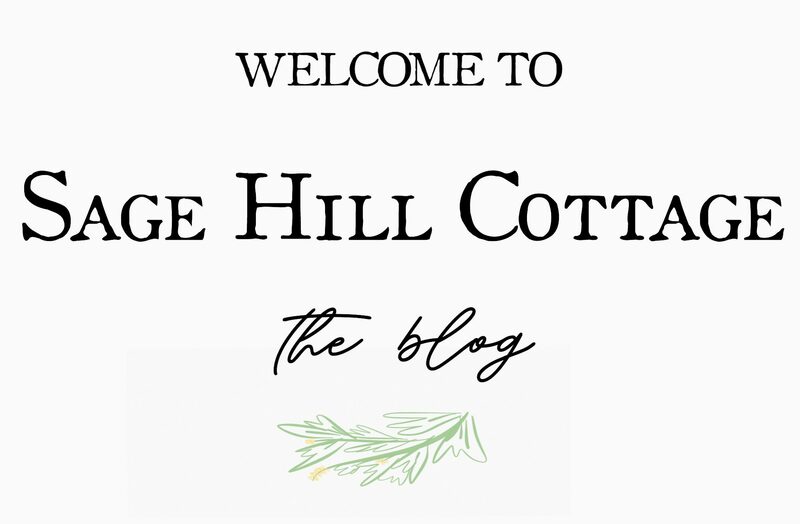 Being part of this wonderful group of bloggers to share a bit of our Christmas homes with you. It’s so fun to meet new faces or welcome some new…so whatever category you might fall into…WELCOME! Be sure to check out the beautiful home tours located at the bottom on this page. Today I would like to share with you my Christmas kitchen. 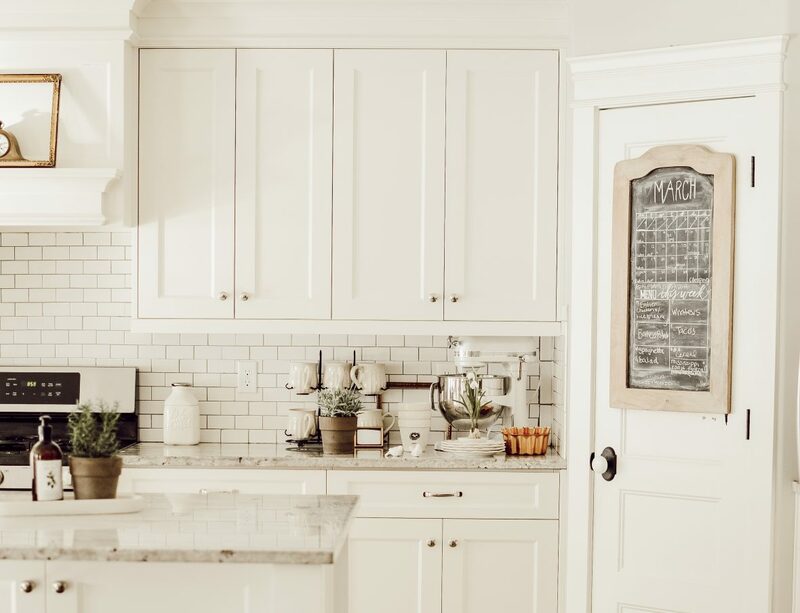 The kitchen is the heart of our home… basically everything happens here… from food prep to breakfasts, homework, entertaining and even teachable moments for our little ones. Above the kitchen is my DIY dropcloth Christmas tree sign. I’m working on a tutorial for that one, because I created it a few years ago. Adding a little bit of faux greenery to this space as well as woods and a pop of red here and there made this space a festive yet functional workspace. This cute crochet stocking garland was one I found at Micheal’s Craft Store last year. And the bell garland is from my December Root & Roam box. They highlight this monthly calendar and menu of the week chalkboard. A staple in my Christmas kitchen has to be a hot cocoa station…we are not coffee drinkers, but man ohhhh man do we love our hot Chocolate! And of course I have to add a bit of whimsy with this little antique Christmas elf (or like we call them Denmark “Nisse” and his little ceramic porridge bowl! Next is the China Hutch…one of my favorites to decorate for the holiday. I went really neutral this year as I switched out my blue and white dishes to these everyday white ware. Also I suggest that if you have little Christmas ornaments that you only have a few of or even one of, they can make perfect little decorations for mini Vignettes throughout your home. I did this with some of my mercury glass ornaments. Well let’s be honest, I dont have that many and the ones I have are so very unique that I just love to display them separate from everything. One day I would love to have a large collection of these beauties. Well my friends, here is my view right now, 9 pm… of my messy kitchen after an evening of entertaining 16 sweet little girls for a Christmas party that was full of hot chocolate, treats and a service project of tying quilts for those in need at our local hospital. There was lots of giggles, laughter, and fun to be had tonight with these darling beautiful girls, and well as some of the kindest grown up ladies who helped put this all together. This is what this Christmas kitchen looks like most of the time during these holidays. Messy…but I wouldn’t have it any other way. Continue the Blog Hop below.. Your kitchen looks so beautiful! I love the quilt on your sofa too. My favorite thing is your built in china cabinet. I love how you’ve styled it. I loved being on this hop with you this week! I think you outdo yourself every year! Every last detail is beautiful. Love the ornaments! Your kitchen is absolutely stunning your entire home seems to embody everything I want for a future home! Great post!! !